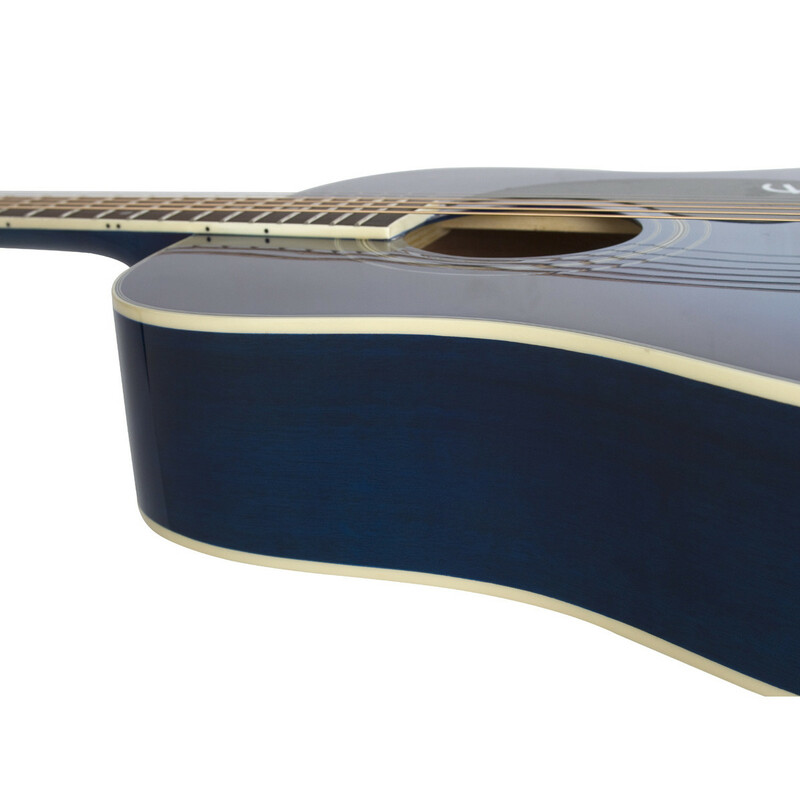 The Epiphone Pro-1 PLUS Acoustic, Trans Blue is the perfect, custom designed solution to some of the biggest obstacles new guitar players face. Following extensive research and over 200 years of guitar building experience, Epiphone have designed this ultra-affordable solid top acoustic to make life as easy as possible for new players. The Epiphone Pro-1 PLUS comes equipped with a solid spruce top for a superior sound with plenty of versatility to accommodate many different genres and techniques. 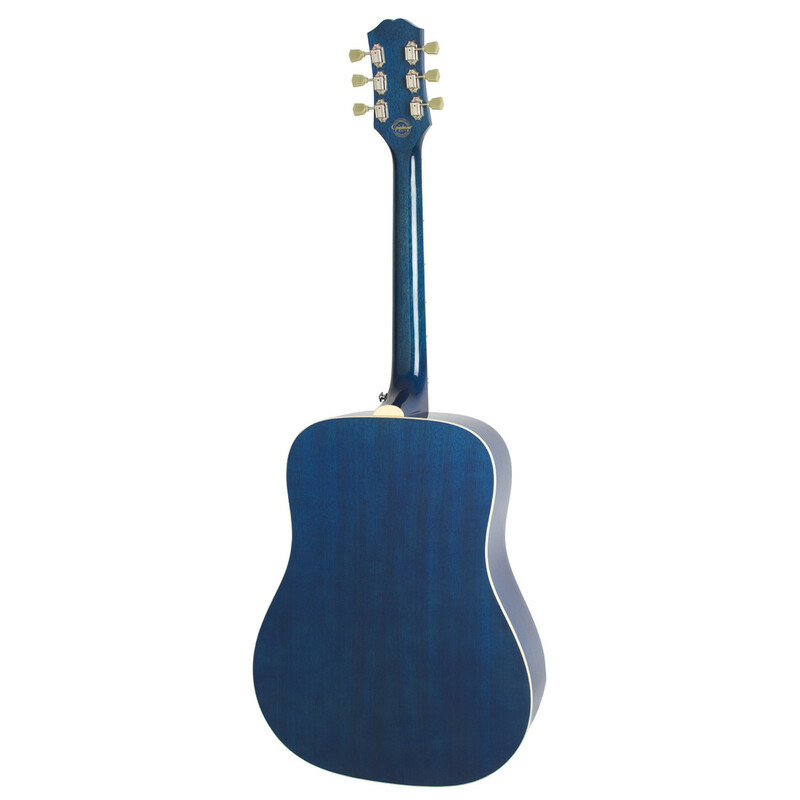 Its select mahogany back and sides add warmth and resonance with plenty of emphasis on the bass and trebles, whilst its PRO-Prietary bracing enhances the guitar's tone and offers a louder, richer acoustic sound. Furthermore, the Pro-1 PLUS also features a PRO-1 ultra neck with EZ-PRO profile, providing comfort and less hand fatigue. Lastly, the Epiphone Pro-1 PLUS also includes a beginners guide to guitar booklet, offering the perfect setup for beginners. The Epiphone Pro-1 PLUS features a solid spruce top that offers a versatile sonic-footprint, yielding crisp articulation, as well as producing a broad dynamic range. Additionally, the Epiphone's solid top also delivers a focused, clear sound of deep lows, warm mid-range, and bright singing highs. The versatile nature of spruce provides the player with a superb response, perfect for numerous genres and playing styles from heavier, meatier strumming patterns to lighter picking techniques. The sonically-versatile solid top is paired with select mahogany back and sides which deliver a punchy mid-range with plenty of warmth and resonance. Together this mixture of tonewoods provides the player with what is well-known as the 'classic' acoustic sound, renowned for its versatility and ability to play beautifully within many different genres and playing styles. 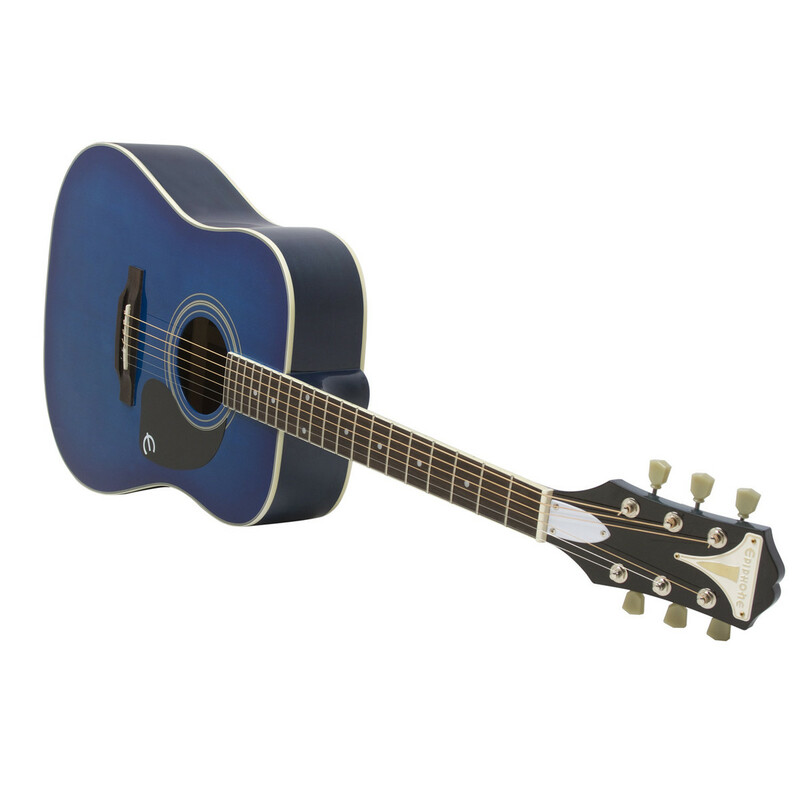 The Pro-1 PLUS Acoustic has been designed to make learning the guitar as easy as possible, perfect for parents needing their child's first guitar or the adult learner needing an affordable and easy-to-play instrument. Additionally, a key feature is the shorter scale length, which offers two huge advantages, frets that are closer together and a slight reduction in string tension. Closer frets make it easier for new players, or younger players, to form chords and fret the instrument cleanly with ease. Likewise, a reduction in string tension requires less effort to cleanly fret the guitar. Furthermore, setup with lighter strings, the player is certain to benefit from smooth, easy playability and reduction in finger fatigue. 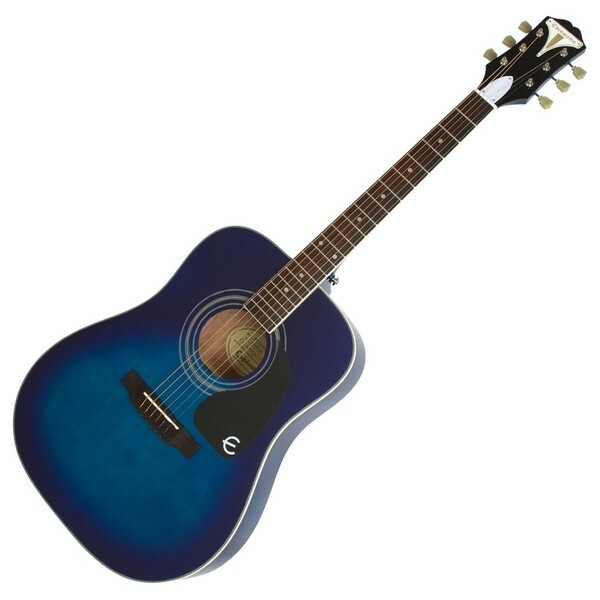 The Epiphone Pro-1 PLUS Acoustic features a thin-profiled dreadnought body which provides a comfortable playing experience throughout both seated and standing performances. Its reduced body depth makes the Pro-1 PLUS Acoustic easy to sit with for long periods of time, perfect for enduring practice sessions where comfort is key. Furthermore, the dreadnought body is the perfect shape for the new player, as its big body offers great acoustic volume and projection while being able to accommodate numerous genres including rock, pop, country, folk, blues to more alternative genres and techniques. All Epiphone Pro-1 PLUS guitars feature jumbo frets to make life even easier for beginners and younger players. Jumbo frets make general fretting easier while also enabling players to master key playing techniques such as bending, hammer-ons and pull-offs. The larger fret size makes it easier for inexperienced players to make plenty of contact with the strings and learn these key fundamentals that will become an every day part of playing. The new player may find string and fingerboard friction painful, and may also prevent their skills from shining through whilst getting used to forming chords and moving up and down the fingerboard. 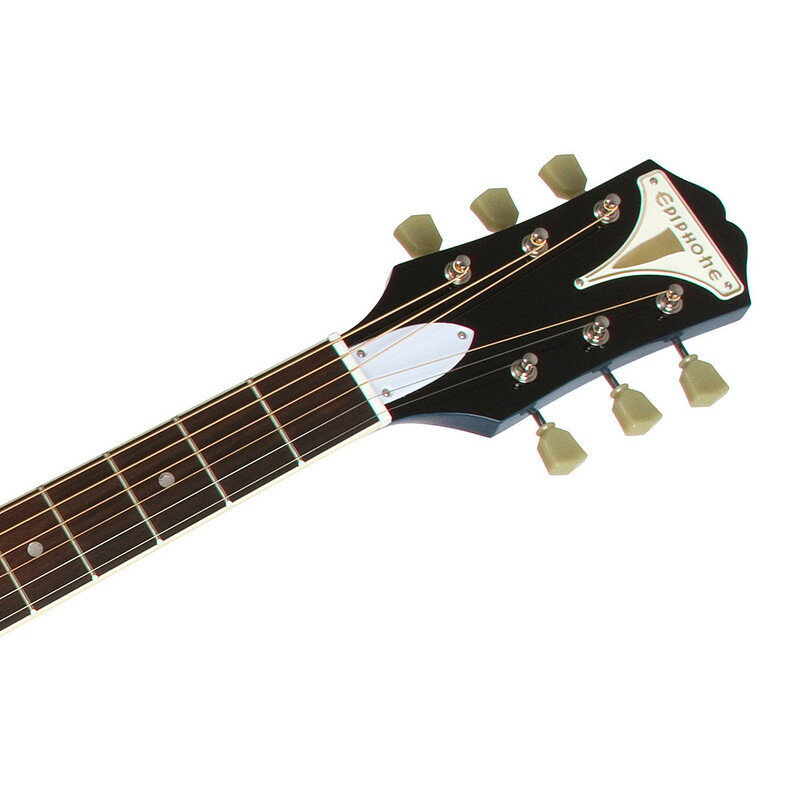 With Epiphone's PRO-Ease string and fingerboard coating, the player is certain to adore and benefit from the smooth, sleek action with reduced string noise.